Crewmachine is a versatile platform, bursting with features and functionalities. One of our most commonly used features is a rich WYSIWYG editor that allows our subject matter experts to easily create beautiful content. Highlight portions of the text and leave comments on it. However, to save our experts time, our editor is also equipped with keyboard shortcuts, promoting economy of movement and boosting productivity. To help speed up your process and reduce the number of mouse clicks you make while writing, I’ve compiled a list of the most useful keyboard shortcuts you’ll need for our WYSIWYG editor. Another incredibly useful keyboard shortcut inserts a link. It’s simply Ctrl+K for PC or Command+K for Mac. But, assuming you’re trying to insert a link on some anchor text, you need to use a sequence of shortcuts. Use the highlight keyboard shortcut to highlight the text you want to use as your link anchor. Once the text is highlighted, use the insert link shortcut, paste in your link, and hit Enter. 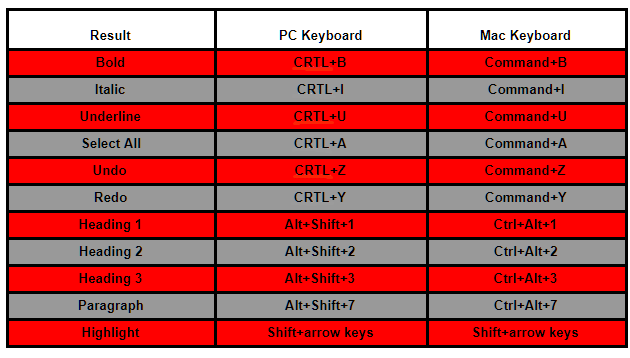 Get to grips with these handy keyboard shortcuts and you’ll be amazed at how much time they save you!